In my POSC 230 class, International Relations, we did a simulation regarding the international “scene”. The class was split up into seven different “countries” – Holy Zott, Spartonia, Pyrote, Crock, Libertania, Zamboni, and Bampff. These countries together made up Lostralia. My country was The Sacred States of Pyrote, a nation comprised of three states unified by their great religious leader and prophet Bolivar. 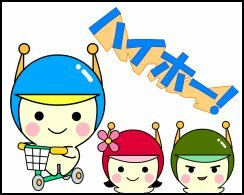 My job in the group was as the bookkeeper and the writer of the news. All in all, I had fun with it, but I had to get accustomed to it. The first article was all too serious and heavy-handed, but then later in the simulation, as I got comfortable with how everyone was doing the news, I started having fun, taking jabs at all of the Republicans in office at the time of the simulation. Please note that what was written for the news pertains to the simulation, and some is for the fulfillment of “secrets” that we were given beforehand. The opinions and statements reflected here do not reflect the personal opinions of the author (i.e. me) or the other group members. 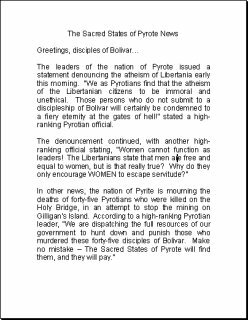 The leaders of the nation of Pyrote issued a statement denouncing the atheism of Libertania early this morning. “We as Pyrotians find that the atheism of the Libertanian citizens to be immoral and unethical. Those persons who do not submit to a discipleship of Bolivar will certainly be condemned to a fiery eternity at the gates of hell!” stated a high-ranking Pyrotian official. In the second issue, I had a lot more fun. After hearing the other groups’ articles, we put some domestic stuff in the news, and the fun began. I also came up with a title for the “High-ranking officials” from last time: Grand Poobah. You may remember that title from the Flintstones, where the leader of the Water Buffalo Lodge was called the Grand Poobah. I only picked on the Republicans a little in this one, but I still had fun. Too much fun? You be the judge. In other news, radical citizens of Bampff were found responsible for the tragic deaths of forty-five Pyrotians on the Holy Bridge. 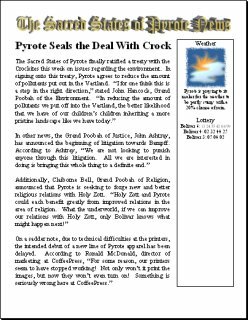 According to Colin Pummel, the Grand Poobah of State, “The Sacred States of Pyrote is pleased to have come to a peaceful resolution with the Bampff Autocracy. We have recognized the official apology from the government of Bampff, and we have also recognized that the government of Bampff is not supportive of the radicals who committed these acts against our citizenry.” Poobah Pummel then continued by praising the fine design work shown on the official letterhead that Bampff sent their apology on, as well as the quality of the paper stock it was printed on. For the third edition, the group encouraged me to give the newspaper itself a bit of a visual revamping. Make it decorative. Don’t just write the articles down. So I did something simple, but it still worked out. New this time was the weather and the lottery. Our professor’s comment regarding the weather was that our prayers were not answered. Weather: Pyrote is praying to its maker for the weather to be partly sunny with a 20% chance of rain. 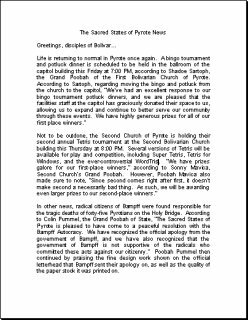 The last news out of Pyrote was perhaps the best of all, as I really went to town on it, knowing it was the last day of the simulation, complete with pictures, sponsors, and products. It ended up being a fitting start to a day that really had a party atmosphere, with Spartonia having a “great feast” and bringing donuts and chips for everyone, as well as the suspense in the air of whether Libertania would meet the demands to bring the daughter of Libertanian President Patrice Wade back to safety, or bring about her execution. 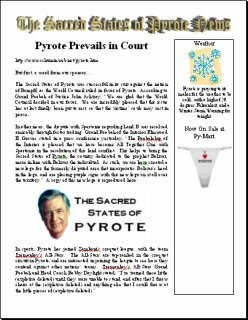 The Sacred States of Pyrote was successful in its suit against the nation of Bampff, as the World Council ruled in favor of Pyrote. According to Grand Poobah of Justice John Ashtray, “We are glad that the World Council decided in our favor. We are incredibly pleased that this issue has at last finally been put to rest, so that the victims’ souls may rest in peace. Weather: Pyrote is praying to its maker for the weather to be cold, with a high of 20 degrees Fahrenheit, and a Winter Storm Warning for tonight. Yes, that is a thong right there, yes, that is Mr. Rogers in that logo (a parody of JMU’s logo), and we really did play the Hi-HO song for the class. On the last day of the simulation, the daughter of Libertanian President Patrice Wade was indeed executed, and by the end of class, the Bampff Autocracy was no more, as all of the other countries except Crock defeated Bampff in a war.